Found today in my mailbox—the snail-mail kind: A note in response to my recent letter to the editor in the St. Louis Post-Dispatch. The note, postmarked St. Louis, but with no return address—of course—was written in a nearly illegible scrawl—all caps, on lined notebook paper. It’s a scrawl that I recognized as soon as I saw the envelope. The previous letter landed in my mailbox without a stamp or a postmark, which meant that The Scrawler tracked me down and came to my house to personally deposit his/her hate in my curbside mailbox. That was truly scary. 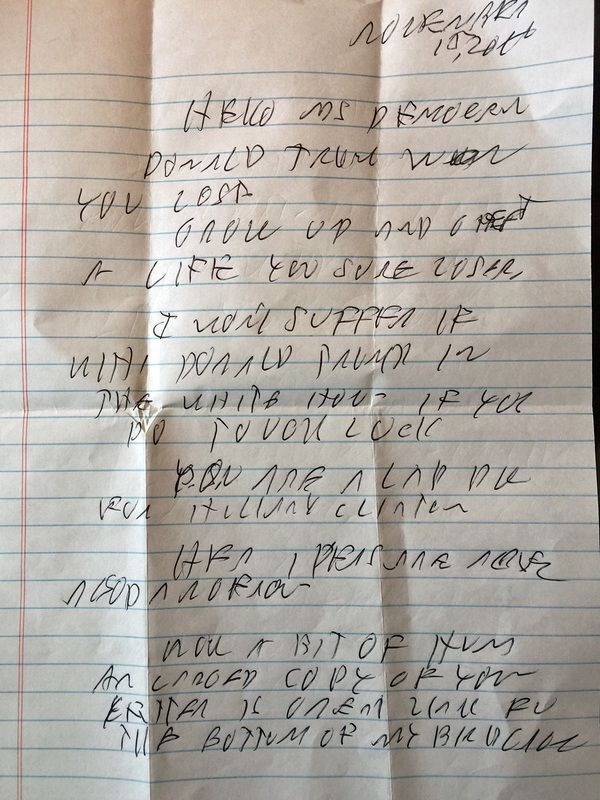 This note is less frightening, but still worth mentioning.The first one came as a shock. This one is less surprising, because we have now entered the Trumpian era, where the President-elect himself has legitimized anger and has brought hate speech into the mainstream. If anyone out there can look at the attached image of the note and decipher the remaining words, please let me know. Next Post:Where does Claire McCaskill stand on Paul Ryan’s plan for Medicare?